If you’re a new reader, you might think today’s post is strange. Let me quickly set the stage for you: I don’t have particularly restful sleep and sometimes when I try to improve it, I have funny dreams. It all started by thinking a seed catalog under my pillow would help me to dream in flowers; since then, the project has taken on a life of its own. Just remember, it’s all a dream sequence and the names have been changed to protect the innocent. Aviation Avenue is pleasant because there is not much traffic and it’s a little more than a quarter-mile long; Pease used to be a back-up emergency landing strip for the space shuttle. The best part of Aviation Avenue, though, is seeing the private jets up close; Cherie and I always tell each other where we’d be going if we were boarding a Gulfstream instead of shuffling around in our scuffed-up sneakers. Cherie’s usually going someplace warm, like Florida or Hawaii and I am never sure where I’m going. I’m more interested in the interior details of the flight. Cherie’s been on vacation this week, though, so I’ve had to take lunch walks alone. I don’t mind, but it’s more fun to have someone to talk to. Thursday was a weird day to walk alone along Aviation Avenue. There was a detour on International Avenue and it was diverting all traffic to Aviation, making the peaceful route absolutely frantic. Then, there was an accident somewhere on Pease and police cars, fire trucks, and tow trucks were racing around. To top it all off, there was a lot of jet noise, like a million planes were taking off at once and the Air National Guard’s KC-135 Stratotanker was cruising around, spending their daily allotment of gub’mint gas. I hate to use the tired expression, but it was a freak show. 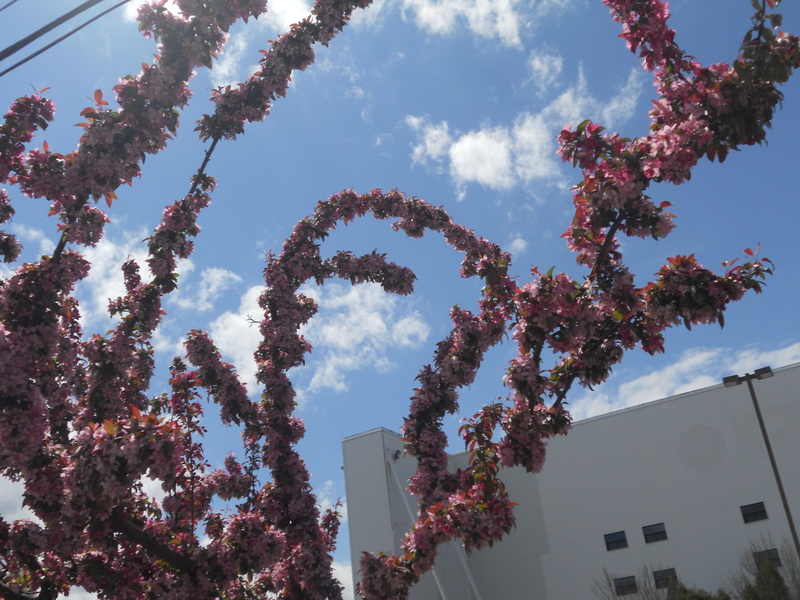 By the time I got to the old Pan Am hangar I thought to myself, “Has the Apocalypse started?” Then I noticed the 16 crab apple trees in front of the building and they were at their blooming peak. It was breathtaking and beautiful; all the noise of the world seemed to stop except for the low hum of one little jet pushing on down the runway and jumping into the sky. These were the things I was thinking about when I finally fell asleep last night. It’s no wonder, then, that Mr. Sandman was escorting me to my plush leather seat in a Gulfstream G650 and my friend Jaxon was the flight attendant. First, he brought me Earl Gray tea in a Wedgwood bone china tea set. Yup, with lemon and one lump of sugar and a side of shortbread cookies. Then, he brought me a goose-down pillow in a flannel pillow case and a Shetland wool blanket. I curled up in the cozy seat, wrapped myself in the blanket, and looked around the cabin. Not surprisingly, Cherie Ripperton was the other passenger and Jaxon was bringing her a big margarita, a hamburger and fries. She was wearing a sombrero; I don’t know how it was staying on her head with its foot wide brim. Only in a dream, I guess. Jaxon is a gentleman in real life, so I guess that’s why he was so professional and courteous as our flight attendant. He was wearing a finely tailored suit; was it an Armani? Why yes, it was. The only out of character part of his attire was the Birkenstocks he was wearing. Jaxon bowed and sat down, the cabin went completely dark, and a bed sheet descended over the door to the cockpit. I guess Gulfstream hasn’t perfected dream sequence movie screens, although it looked like it might be a 2,000 thread count Egyptian cotton sheet. As can only happen in a dream, it was dark in the cabin but bright blue sky outside and no one suggested we pull our window shades. I didn’t watch the movie. I was looking outside; I thought I could see a crab apple branch in the corner of my window. The branch looked more like a spider tentacle, the pink flowers all fuzzy and moving. It was also like a rope, and it was getting bigger and closer and wrapping around the plane. I looked across the aisle to see if there were branches visible in the other windows. Sure enough, the branches were wrapping around the jet. Cherie and Jaxon were completely oblivious, laughing uproariously at the movie. Since it was a dream, I thought I was screaming at the top of my lungs but no one could hear me. The rear of the cabin was filling up with crab apple tentacles and one was starting to wrap itself around my ankle. Elvis didn’t answer and I heard the high-pitched barking of a small dog. Breaking through the fog of sleep, crab apple blossoms, and pork rinds, I woke up and realized it was the annoying little dog in the chicken coop condo above me. Another night of restless sleep was over and there was nothing left to do but brew a cup of coffee and write about it. Happy Friday; you are now free to move about your own Pease Tradeport. 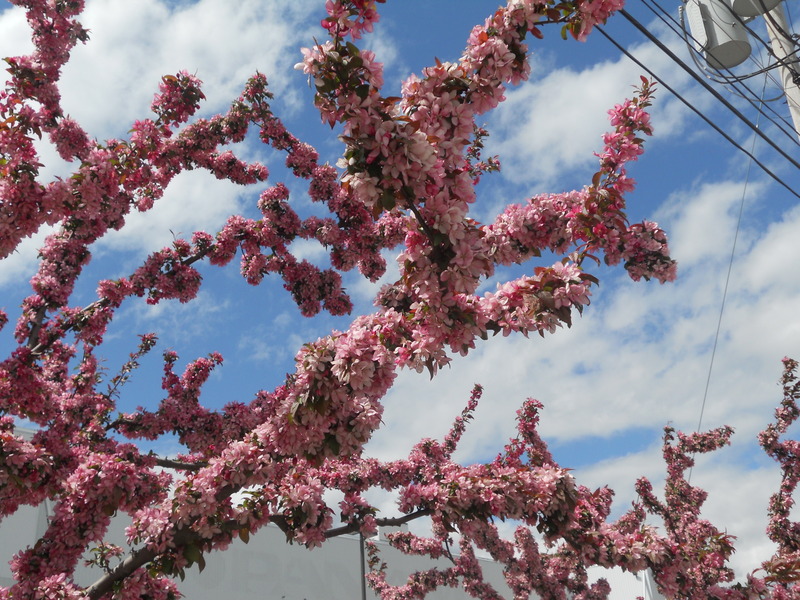 Don’t forget to stop and smell the crab apple blossoms. This entry was posted in Friday Pillow Talk and tagged Apocalypse, Birkenstocks, Elvis Presley, Gulfstream G650, Jet noise, Pease Tradeport, pretty flowers, Robert Goulet, The Daydreamer. Bookmark the permalink.